Many parents expect their children to acquire cavities as they grow older, and often are surprised when children leave the dental office without the need for fillings. 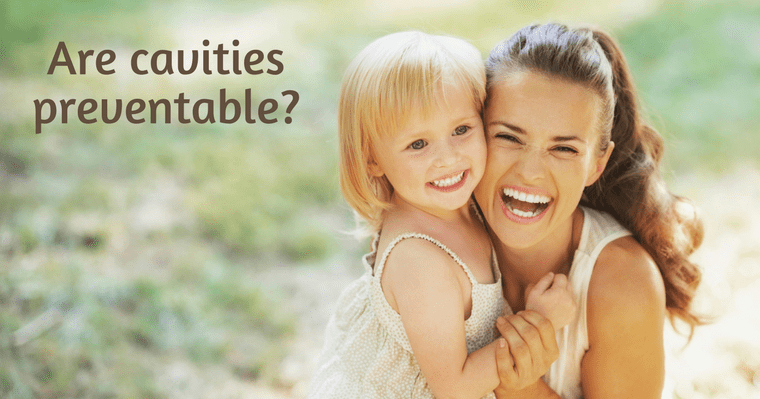 Are cavities really an unavoidable part of childhood? The answer lies in the underlying cause of cavities. Find out what you can do to protect your teeth from cavities and the shocking link between cavities and your overall health. A very common, and often accepted oral infection caused by bacteria is known as caries. A damaging result of the caries infection process are holes in the teeth commonly known as cavities. Cavity-causing bacteria use sugar from the diet to produce lactic acid that softens and erodes the tooth enamel. If the acid-producing bacteria are not eliminated or suppressed, they continue to damage the infected tooth and spread to healthy teeth. Unless the population of bacteria is suppressed, trips to the dentist year after year, visit after visit, can be disappointing, expensive, and painful with a continual cycle of cavities and fillings. The reality about cavities is that the bacteria that cause cavities are transmissible and are often introduced to a child at a very early age from a primary caregiver. This happens by kissing, sharing utensils, drinks, or other forms of salvia exchange. Once the cavity-causing bacteria are introduced to the mouth they can grow out of balance resulting in disease and tooth damage. Limit sugary or starchy foods in your diet. Supervise your child as they brush twice a day. Limit fruit juice, candy, cookies, soda, and other sugary drinks like fruit juice. Avoid sugary foods after nighttime tooth brushing. Bring your child for his first dental visit around his first birthday. We will discuss options like fluoride treatment and dental sealants. Now that you know how to protect your teeth from cavities. Are there any other potential dangers of cavities? Can Cavities Affect Your Overall Health? Reduce your body’s ability to make a beneficial substance your blood vessels need, called Nitric Oxide. Contribute to the process of plaque buildup in the arteries (atherosclerosis) which can increase the risk of heart attack and stroke. Cavities are NOT a part of life. In fact, avoiding them will improve your quality of life and chance of serious systemic diseases. As a Wellness Dentistry Network and Kois member, Dr. Vanama performs a thorough cavity examination and provides comprehensive treatment recommendations to assist in breaking the cycle of repeated tooth damage, costly repairs, and unnecessary pain from this destructive infection. Understanding cavities is another way your Issaquah family dentist shows a keen awareness of how oral conditions can affect overall health. Download Dr. Vanama’s free educational eBook — Dentistry for Total Body Wellness — for more information or call 425-295-7975. See our article in the July issue of Connections, a monthly community newspaper published by Issaquah Highlands Council.